It all started with Peyote. In 1993 Bill Clinton signed the Federal Religious Freedom Act to allow the Indians to use peyote in their religious ceremonies. Of course when the Rasta’s in Florida wanted their religious rights upheld to smoke marijuana in deference to their God, Ja, they were refused; but it all started with the peyote. 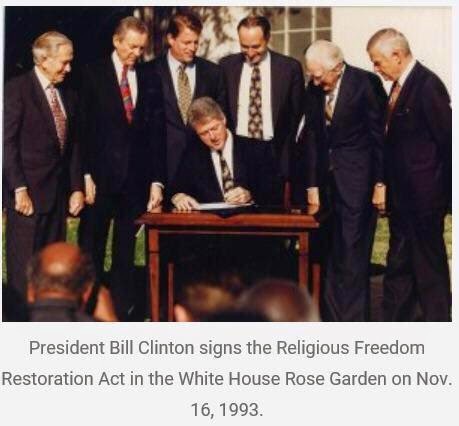 By 1998 it was becoming sort of a fashion to champion state laws protecting Religious Freedom; and as usual we now have a patchwork quilt of laws in different states; all of which are keeping the attorney’s very busy. Now, this past week, we have the Indiana law weighing in; supposedly in the name of religious freedom; and at this writing the Governor is demanding clarification of the law’s provisions to ensure his state is “gay friendly.” It’s a shame that the reason he caved in was due to public pressure and not sound law; which the bill was not to begin with. We’ll get to that. But first, why was this bill received by the public with such an immediate and decisive response? What’s different in this bill that is different from the 1993 Federal law; as well as the 2 dozen other states which have Religious Freedom Acts on the books? Well, the first thing which struck me when I read it; I actually do that; was that Section 5, which purports to grant rights to Religious groups, actually makes it legal for an OPINION to be a valid reason to deny someone else the right to service. The law takes great pains to define certain words in the bill; but nowhere does it define the term Religion; leaving the door open for an inability to determine anything in court. Under such vaguely written statute an opinion can be construed as a religion. This would actually make the Rasta’s quite happy, as they ritually; or religiously; smoke weed. It’s not just about wedding cakes. It works both ways, you see. Additionally, this was the first law of its kind to target individuals as opposed to businesses. Section 11 of the bill actually abrogates your right as an individual to bring suit against an employer; thus making the State both the Legislature and the Judiciary. This is something we don’t do in America. The principles of Separation of Powers; and Conflict of Interests; is the backbone of Democratic Republican form of government. I love using those two words together. It confuses some people. And it also shows the true divisive nature of our two party system. The very titles of the two parties immediately divide the populace. Democratic Party implies a Populace form of government; where the majority rules. That is not the case here. And the Republican Party smacks of nobility and privilege. Together the two keep us all at odds, and themselves in power. The most common example in this whole Indiana thing has been the Baker. The Baker has rights. So do his customers. But the law says the Baker can’t discriminate against specific groups of people; in this case Gay and Lesbian couples. But the Bakery itself has rights which are only related to its operation. The Baker may choose to disassociate with Gays in his personal life; but as a Bakery, he is bound by Federal Law to serve all people. It’s very simple. But here comes yet another Conservative politician; who all agree we have too many laws; passing another useless, and flawed law. So flawed, in fact, that at this writing the Governor of Indiana is demanding the Legislature rewrite the law to make sure it is gay friendly by this Friday. We shall see. And here is the full text of Indiana’s “religious freedom” law. See if you can spot the difference and pay attention to Sections 5 and 11.